Since we touched upon the question of the subjective personal identity that largely predetermines our views and beliefs, I invite you to explore the following exercise. To carry out the exercise, at least for the first time, you will need to move around the room so make sure you have enough space to make five small steps in front of you. Print out this page or use portable device such as phone or tablet to make it easier to complete the exercise. Decide on what context you are working with. A situation where you think you might have acted guided by your fear or secondary gain. To start with, it is recommended you choose something small, not the largest problem in your life and, as you become more familiar with this technique, you will feel more comfortable moving on to a larger and more complex situations. 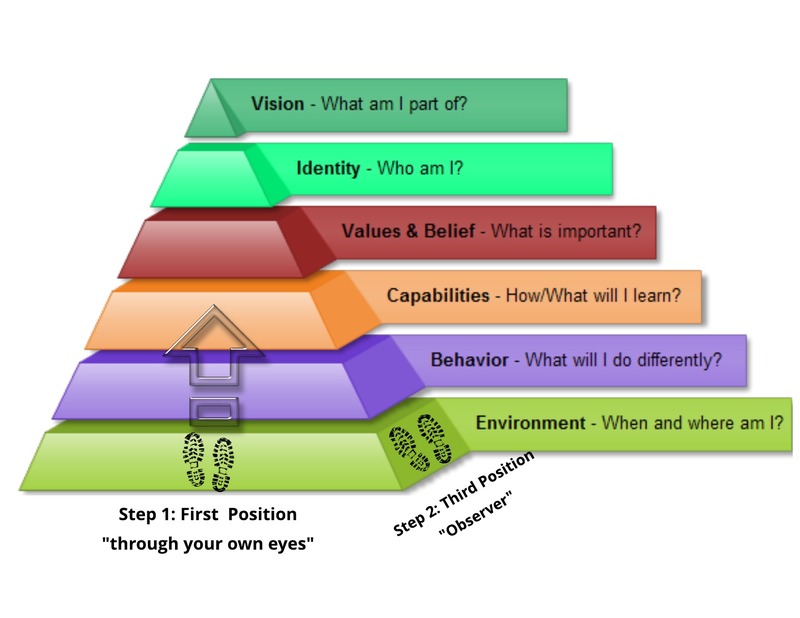 First Position: This is where you consider the situation from your own perspective, as seen through your own eyes. Most of us live our entire lives viewing events and circumstances from this position. Second Position: This is where you gather information from situation as if you were an Observer. You are now a neutral eyewitness who is looking down at the event(s) and at yourself. Pay attention to how your perception of events changes as you move ‘further away’ from the First Position. To skip the lengthy explanation – as I am sure you want to see results straight away – below is a chart of the steps that you should follow very closely. Step 1. First Position: Remember, here you are experiencing things through your own eyes. Pay attention to the ‘environment’ surrounding you. Where you are, people around you. Notice also what you are wearing and how you look and what are others around you doing. See what you see, hear what you hear, notice what you notice. When you are ready, step out of that Position. Step 2. Second Position: Now look at the situation and at yourself from the position of an observer. What opportunities you might have missed? Think what you would like to change or do differently. Take your time. Step 3. Now go back to the First Position and ‘take in’ all the learning and notice how things might have changed in light of this new insight. Now you are ready to make one step forward. You will need to repeat the same steps for every new ‘level’, as shown above. Step 4. Again, start from the First Position. Now pay attention on your ‘behaviour’. Notice things like your breathing patterns, posture, body language, tone of voice. How are you responding to the situation? What are you doing and what are you choosing not to do? Step 5. Second Position: Look at yourself standing there now. What could you do differently? What would benefit you better in this situation? What would you improve in your body language, posture and tone of voice? Step 6. Go back to the First Position again and ‘take in’ the new learning. Notice how things might look differently now from your ‘more aware’ position. Think how people (if present in this scenario) would respond differently. Now, with your new learning on board you are ready to move to the next ‘level’. Step 7. First Position. Now think of your skills and capabilities. What previous experience and expertise you have to support you in this situation. What available resources you are using or choosing not to? Step 8. Second Position: Look at yourself as an observer. What other resources you have that could assist you? What would you like to change? Do you need any additional training or resources to assist you in the situation? Is there anyone who could help you to progress? Step 9. Go back to the First Position again and ‘take in’ the new learning. Notice how things might look differently now that you have found more potential useful resources. When you are ready, move one more step further. Step 10. First Position. Now notice what you believe to be true about the situation and what is important for you at this moment in time. What values do you hold dear? What limiting beliefs are preventing you from going for it? Step 11. Second Position: Now from the position of a third party think what beliefs and values would benefit you better in this situation? What limiting beliefs you are ready to let go off and what empowering beliefs you are ready to embrace? Step 12. Back to the First Position. Notice how it feels like with your new beliefs and values. How in the view of what’s important for you the situation seem different now. When you are ready, make one more step further. This is probably my favourite part! Step 13. First Position. This is a domain of your identity. Think of who are you in this given situation. A lot has been told about various identities we take depending on our ‘roles’. Think of what identity you take in this particular situation and how well it serves you. Step 14. Second position. Think now what identity would serve you better in this situation. The most empowering words I have ever heard were: “I am the gold standard when it comes to this business”. What do you prefer to believe about yourself and where do you set up your boundaries? Step 15. Now back to your First Position and with your new identity in mind absorb all the new learning. How do you feel differently now? Step 16. When you are ready, make one step back on the level of Values and Beliefs and notice how this might have changed to reflect your identity. Slowly walk all the way back to Skills and Capabilities, to the level of your ‘Behaviour’ and the ‘Environment’. Reflect on all the positive insight you have gained during this exercise and think what you will do next time in the same situation.